Every quarter Apple’s management issues a “guidance” or forecast of their own earnings in the following quarter. Over the years, this figure has been nearly useless because not only is it not accurate, the error itself has been wildly variable. 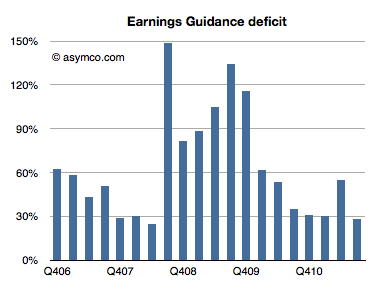 I plotted what I call the Earnings Guidance Deficit for Apple based on the formula (Actual EPS diluted – Guidance)/Guidance.